and home collection... all completely free! Take a few minutes to tell us about your car, take some photos and describe its condition. Dealers from across the UK compete to give you the best offer. 82% of offers arrive within 48 hours. Choose the offer that's best for you. The buyer will arrange payment and collection with you directly. "It was super easy to do. You post pics and wait for offers. Tootle hook you up with the dealer behind the offer you like the best and then it's between you and the dealer. In my case, I drove the car to the dealer, but I hear that the dealer can come to you too. Money was in the bank before I left the showroom." "I accepted an offer within an hour of going live and there was no haggling when the dealer arrived to collect the car, I was instantly paid the amount we had agreed." "I got £400 more than the dealer offered me to trade in. Uploaded pics of my car, the service book and within the hour I was offered a price. Took the car to a dealer who immediately transferred the funds into my bank and dropped me home!!! AMAZING! In short I cannot praise Tootle enough." "Uploading the photos was easy and within about 10 minutes of the ad going live, I had an offer. We got several hundred pounds more than we were offered by the garage supplying our new car and also than WeBuyAnyCar. 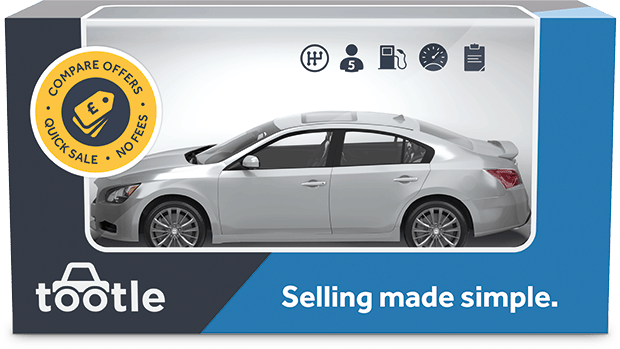 If you want a quick, easy and efficient way to sell your car, Tootle is it." "We got more for the car than our local Hyundai dealer would offer and more than the well known 'we buy your car' websites. Once listed, we received an offer from a dealer within an hour; next working day the money was in our account and someone came to collect the car." "Excellent experience. I accepted an offer after 2 days and the dealer collected the car at the time agreed. The quoted price was honoured, unlike other online valuation sites. I would recommend Tootle to anyone wanting a good price for their car with a hassle-free process." "I was offered as low as £7,500 for my 2 year old galaxy. But Tootle have managed get me a wow £10,500. It was hassle free, quick and easy. Auto trader out. Tootle in. Best thing is that it didn't cost me a penny." "I was trying to sell my car for months, getting stupid and fake offers using Auto Trader and other selling websites. As soon as I found Tootle I was contacted via legit dealers instantly and was able to sell my car within the week!" "Quick, friendly and professional service taking the stress out of selling our car. We received over £1,000 more than from other firms. The buyer was over 4 hours away, yet we didn't leave our door. A driver collected the car and the money was in our account straight away. Highly recommended!" "Excellent 1st class service from start to finish getting you the best price for your more than £500 more than We Buy Any Car offer you would recommend Tootle to anyone." "I ended up getting more for my car than I anticipated. And I was aiming high. It feels like Tootle has solved one of life’s little niggles. Cars are high value items and exchanging them can equal high value stress. Well not any more. I won’t ever consider not using Tootle. Like my car, I am sold." 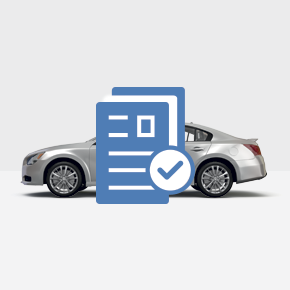 With every car verified with Experian, deals are safe, secure and reliable. Finding your next car can be tough, but with Tootle Retail we're here to make your search even easier. All cars are from our trusted and approved dealers, so find a car tailored to your needs today. Why should I sell my car with Tootle? It's a simple idea: you get more money when you offer your car to more buyers. Rather than haggling with a single dealer on the forecourt, wouldn't it be nice if the buyers were competing with each other for your car - all from the comfort of your home? Tootle helps re-balance the relationship between car owners and professional car buyers, making sure you get the best possible price. Unlike a private sale or an online auction, you're dealing with professionals who have been checked out by us. They have the money and a constant need for new vehicles, meaning that you can sell your car quickly to someone you trust. The whole process has been designed to be as quick, easy and efficient as possible. 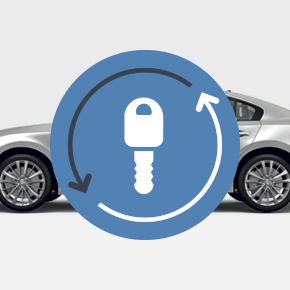 Simply enter your car details using the form above, upload a few photos, let us know about its service history and any damage... and that's it! Are there age or mileage restrictions for selling my car on Tootle? We can provide an immediate offer for cars of any age and with any mileage. If you want to take advantage of bids from multiple buyers, your car must be less than 10 years old and have less than 120,000 miles on the clock. Does Tootle charge me any fees? No, Tootle is always free for sellers: unlike our competitors, we don't charge for valuation or any other part of the sales process. That's just one of the reasons our sellers get up to £2000 more when they sell a car with Tootle. By advertising your car to more than a thousand buyers across the UK, Tootle makes dealers compete for your car. It maximises the price you can get when compared with a trade-in or sale to a traditional dealer or car buying service. How will I handover my car? More than 90% of the cars bought on Tootle are collected direct from the seller's driveway. Every offer you receive will make it clear how the car is to be handed over, letting you choose the perfect offer for you based on price and convenience. Is Tootle buying my car? No - we know that a single offer is never going to be as good as a competitive auction. That's why we show your car to more than 1000 buyers across the UK to ensure that you get the best possible price. If you accept an offer, the buyer will deal directly with you to transfer the money and collect the car. Who are the dealers you work with? Tootle's aim is to ensure that you get the best price for your car, whatever the make, model or age. We work closely with over a thousand professional car buyers across the UK so it's shown to as many interested buyers as possible. My car's financed. Can you still sell it? What if my car has scratches or mechanical problems? Why is my listing not visible? We only share descriptions of cars once they are complete. In order for you to get the best possible price with the minimum of effort, it's important that Tootle's trusted buyers understand what they're making an offer for. That takes out the need for haggling when they come to collect the car, something other car buying services often introduce at the last minute. If your car description is missing photos, or if you haven't completed the details and damage report, we'll need to wait for this information before we start advertising it to buyers. Listings may take a few minutes to appear so if you can't see your car, try refreshing the web page. 82% of offers are made in the first 24 hours of your listing going live. Once you have accepted an offer you will need to arrange handover directly with the buyer. Do I have to accept an offer, even if I'm not happy with any of them? No - you are under no obligation to accept an offer. We think we'll be able to get you the highest possible trade-in price for your car. If you're not happy with the price or handover options you receive, we encourage you to contact the dealers to see if they can come closer to your expectations, but if you're still not happy you can simply choose not to accept any of them. Your profile will expire after 7 days, at which point we will stop marketing your car to our dealers. What if no one makes an offer on my car? Demand for cars can vary week on week depending on our buyers' stock levels and needs. Although many offers are made in the first 48 hours, you are likely to receive offers at any point during the five day listing. If your listing has ended without any offers, we suggest re-listing the car or contacting Tootle on 020 3327 2240 or at hello@tootle.co.uk. You will also be able to get an offer from our partner car buying services which will make an offer to buy nearly any car. You will get paid by the dealer who buys your car from you. We simply collect offers from our network and match you to a dealer. We are not involved with the actual transaction. Will buyers honour the offer they have made? Tootle's platform is based on transparency: by uploading photos and being truthful about the condition of your car, dealers know exactly what they're buying and offer a fair price. We only work with reputable dealers, so in the majority of cases, if the car matches its description, there's no reason for an offer to be lowered in person. Check out our Google reviews for an unbiased opinion on the process. It means there's no haggling - the price you're offered is the price you should get. Will you sell my car if it has been used as a rental car, for private hire, for driving instruction or as an emergency vehicle? Yes - we will still list your car if it has been used for one of the above purposes, however it is critical that you disclose this information from the outset. Some dealers will not accept these types of vehicles and will pull out of the deal if the car's history becomes apparent. On the other hand, some dealers will specialise in these cars and will offer you the best money possible for them. Tootle will only share your phone number with sellers who have already made an offer on your car. It means that you won't be bothered by time wasters, but can still talk genuine offers through. Other than that, your data is always safe with us: we will never sell your information or share it with anyone else. How do I know if my offer is a good price? We aim to make sure that every seller on Tootle gets a fair deal. 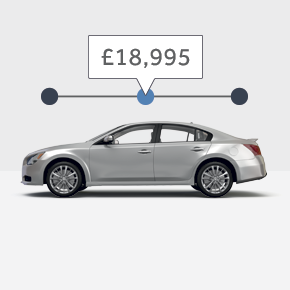 Our unbiased industry data lets you understand how much similar cars sell for, helping you understand how an offer on Tootle compares to the rest of the market. The Tootle team is always on hand to help: we're reachable by email, instant chat, and phone. With UK-based customer support, we guarantee whatever the issue, it will be resolved quickly and efficiently. Let us know how we can help you. Contact us by phone or email below, or fill out your details in our contact form and we'll give you a shout! We won't sell or give your email to third parties for marketing purposes. We will use your email address to contact you specifically about this valuation or selling this car. You will be able to opt-out of receiving emails from us at any time by using the unsubscribe links in an email or by emailing hello@tootle.co.uk with the subject REMOVE.